Professor Eugene Healy is Professor of Dermatology/Honorary Consultant Dermatologist within Medicine at the University of Southampton. Professor Healy graduated in medicine from Trinity College, Dublin and conducted his general medical and early dermatology training in Dublin. He was awarded a Medical Research Council (MRC) Clinical Training Fellowship (1994-1997) during which time he conducted his PhD in Newcastle upon Tyne. He subsequently moved to the MRC Human Genetics Unit in Edinburgh as a MRC Clinician Scientist and later was appointed to the University of Southampton. He was awarded a MRC Senior Clinical Fellowship (2001-2006) and was originally Professor of Molecular Dermatology from 2002 before taking over as Professor of Dermatology/Head of Academic Dermatology in the University of Southampton. Professor Healy’s research interests comprise skin responses to ultraviolet radiation, pigmentation, skin cancer and skin immunology. His research includes molecular biological, genetic and immunological approaches to investigating disease and spans from in vitro laboratory studies to in vivo human clinical trials. He has supervised clinical and non-clinical training at BMedSci, MMedSci, academic F2, Academic Clinical Fellow, Specialist Registrar, MSc, PhD, and post-doctoral scientist up to Lecturer/Senior Lecturer levels. Potential clinical and non-clinical students and people wishing to join his group are encouraged to contact Professor Healy. He is a consultant dermatologist in Southampton University Hospitals NHS Trust.  Medical Research Council Clinical Training Fellow, University of Newcastle upon Tyne. 1994-1997. Medical Research Council Clinician Scientist Fellow, MRC Human Genetics Unit, Edinburgh and University of Newcastle upon Tyne. 1997-1999. Exposure to natural and/or artificial ultraviolet radiation, from sunshine and sunlamps respectively, causes many effects in the skin. These include sunburn due to release of inflammatory mediators, tanning as a result of the production and redistribution of melanin pigment, damage to cellular DNA, generation of reactive oxygen species, synthesis of vitamin D, suppression of skin immunity, loss of collagen resulting in photoaging, and the development of melanoma and non-melanoma skin cancer. Ultraviolet radiation is also used therapeutically by dermatologists to treat a wide variety of skin diseases, including inflammatory skin diseases such as psoriasis and atopic eczema. Factors which increase susceptibility to ultraviolet radiation induced-damage, and which can lead to the growth of skin cancer, comprise phenotypic characteristics such as red hair, fair skin (which sunburns easily and tans poorly), and freckling, each of which result from alterations/variants in the melanocortin 1 receptor (MC1R) gene. Professor Healy’s research aims to understand susceptibility to the detrimental effects of ultraviolet radiation and to gain greater insight into the mechanisms underlying the beneficial effects of this modality when used in a therapeutic setting. This will help to minimise risk from environmental exposure to ultraviolet radiation and assist in optimising the benefit/risk ratio of ultraviolet radiation when used for treatment of skin disease. In addition, Professor Healy’s research on skin cancer susceptibility and development aims to improve prevention and enable identification of new therapeutic approaches for this cancer (note that skin cancer is the most common type of cancer in the UK). 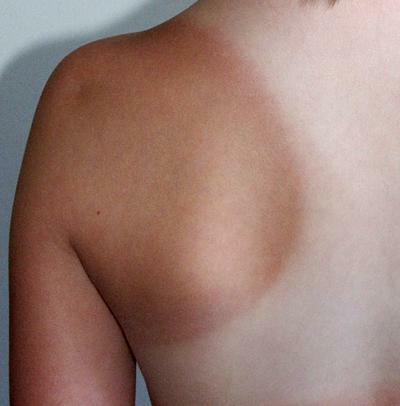 Figure 1: Exposure to ultraviolet radiation in sunshine causes skin tanning, but also causes many other “invisible” effects in skin. Figure 2: People with fair skin are particularly sensitive to the detrimental effects of sunshine. Single nucleotide polymorphisms, such as this G to A transition, in the melanocortin 1 receptor (MC1R) gene are a frequent cause of fair skin. The skin immune system plays a central role in maintenance of skin health and in dealing with exogenous insults such as infections, contact sensitisers and ultraviolet radiation. Consequently, dysregulation of cutaneous immunity underlies the pathogenesis of various skin diseases including psoriasis, eczema and contact allergic hypersensitivity where the immune response is “overactive” and skin cancer where the immune response seems to be “underactive” as a result of immunoregulatory cells. Professor Healy’s research, which employs both ex vivo and in vivo approaches, aims to delineate the regulation of the skin immune system as a means to understanding susceptibility to skin disease, with a view to manipulating dysregulation of the immune system as preventative and therapeutic strategies. 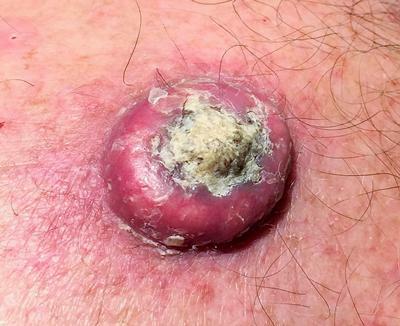 Figure 3: Skin cancer (seen here) is the most common cancer in the UK and worldwide. Exposure of the skin to ultraviolet radiation leads to DNA damage and the accumulation of numerous mutated genes in the skin cells, which alongside alterations in skin immunity, leads to skin cancer development. 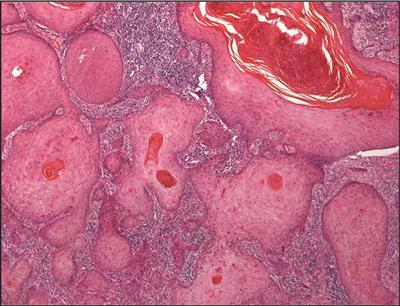 Figure 4: Examining skin cancers under the microscope shows disorganised skin cancer cells (large pink areas with darker pink/red centres) surrounded by an immune cell infiltrate (blue/purple smaller cells). 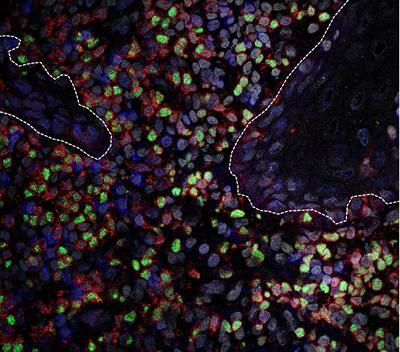 Figure 5: Part of the reason that the immune cell infiltrate fails to attack the skin cancer is due to the presence of regulatory T cells (seen here as FOXP3+ green cells using 4 colour confocal microscopy) which suppress effector T cells in the immune cell infiltrate. The skin cancer cells are delineated by the dashed white lines. Member, National Institute for Health and Care Excellence Public Health Advisory Committee on NICE guidelines [NG34] Sunlight Exposure; Risks and Benefits. Healy, E., & Friedmann, P. S. (2007). Under the spotlight: skin therapy for asthma. Clinical & Experimental Allergy, 37(9), 1261-1263.
Cooper, A., Robinson, S. J., Pickard, C., Jackson, C. L., Friedmann, P. S., & Healy, E. (2005). ?-Melanocyte-stimulating hormone suppresses antigen-induced lymphocyte proliferation in humans independently of melanocortin 1 receptor gene status. Journal of Immunology, 175(7), 4806-4813. Alam, N. A., Bevan, S., Churchman, M., Barclay, E., Barker, K., Jaeger, E. E., ... Houlston, R. S. (2001). Localization of a gene (MCUL1) for multiple cutaneous leiomyomata and uterine fibroids to chromosome 1q42.3-q43. American Journal of Human Genetics, 68(5), 1264-1269. Harding, R. M., Healy, E., Ray, A. J., Ellis, N. S., Flanagan, N., Todd, C., ... Rees, J. L. (2000). Evidence for variable selective pressures at MC1R. The American Journal of Human Genetics, 66(4), 1351-1361. Healy, E., Flanagan, N., Ray, A., Todd, C., Jackson, I. J., Matthews, J. N. S., ... Rees, J. L. (2000). Melanocortin 1 receptor gene and sun sensitivity in individuals without red hair. Lancet, 355(9209), 1072-1073. Healy, E., Belgaid, C., Takata, M., Harrison, D., Zhu, N. W., Burd, D. A. R., ... Rees, J. L. (1998). Prognostic significance of allelic losses in primary melanoma. Oncogene, 16(17), 2213-2218. Healy, E., Belgaid, C. E., Takata, M., Vahlquist, A., Rehman, I., Rigby, H., & Rees, J. L. (1996). Allelotypes of primary cutaneous melanoma and benign melanocytic nevi. Cancer Research, 56(3), 589-593. El-Deiry, W. S., Tokino, T., Waldman, T., Oliner, J. D., Velculescu, V. E., Burrell, M., ... Vogelstein, B. (1995). Topological control of p21WAF1/CIP1 expression in normal and neoplastic tissues. Cancer Research, 55(13), 2910-2919. Healy, E., & Friedmann, P. S. (2010). Cutaneous reactions to drugs. In D. A. Warrell, T. M. Cox, & J. D. Firth (Eds. ), Oxford Textbook of Medicine (pp. 4724-4730). (Oxford Textbook). Oxford, GB: Oxford University Press. Healy, E. (2010). Disorders of pigmentation. In D. A. Warrell, T. M. Cox, & J. D. Firth (Eds. ), Oxford Textbook of Medicine. 5th edition (Oxford Textbook). Oxford, GB: Oxford University Press. Healy, E., Irvine, A. D., Lear, J. T., & Munro, C. S. (2008). Diseases of the epidermis and appendages, skin pigmentation and skin cancer. In D. Kumar, & D. Weatherall (Eds. 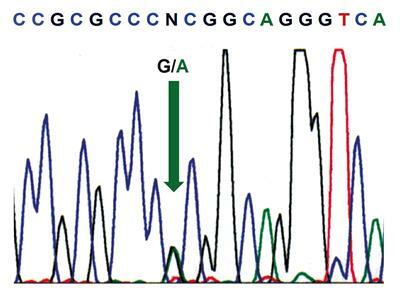 ), Genomics and Clinical Medicine (pp. 507-527). (Oxford Monographs on Medical Genetics). Oxford, GB: Oxford University Press. Teaching dermatology to undergraduate medical students (lectures and clinical sessions). Teaching dermatology trainees in the clinical situation and at national fora (e.g. Biology of the Skin Course). Assessment of dermatological training locally (mini-CEX, case-based discussions) and nationally (question writing for MRCP Dermatology Specialty Certificate Examination). Lecturing on MSc in Allergy Course, University of Southampton.